Heavy-duty stands are, by their very nature, big and heavy, therefore offering greater levels of stability. Individual tubes tend to be of thicker diameters, while doubled-braced tripods are the norm, making for a stronger, more rigid stand from the ground up. This added strength brings with it advantages: boom arms can be longer and extra items can be clamped off a single stand. The only downside to such versatility is that all that metal has to be dismantled, carried and stored at the end of the night. In particular, memory locks - which abound at this level - are great for enabling you to set your stands up at exactly the same height. However, using them means forfeiting the telescopic capability of stands when breaking down, leaving you with each stand in several pieces rather than one. In general, today's hardware is of an extremely high quality across the board, and the level of engineering on heavy-duty stands is uniformly impressive. Choosing a stand is more a question of personal preference rather than brand superiority. No matter how accomplished your stands are, there's one hardware accessory that no drummer should be without: a proper sized, rubber-backed drum mat. Without one, a polished wooden stage will make a mockery of even the heftiest of stands. Solid and capable set of stands that offer a near-perfect blend of weight, efficiency and features. Typically robust in construction, the stands are all double-braced and a good range of adjustment is possible, particularly on the all-important hi-hat stand. The prices are decidedly reasonable for such high quality products. Classy range of stands from a company that began life making hardware. A slick design includes hefty double-braced tripods, integrated memory locks on all tube joints as standard and fine tooth tilters. 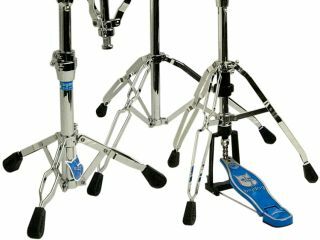 The twin-pedal hi-hat stands are extraordinary. All 5000 Series stands are also available in a narrower 1" diameter base tube for those seeking a lighter alternative. Reassuringly chunky range of stands that share many attributes with Pearl's top Advanced hardware line. Features abound, including Uni-Lock tilters and air suspension tips on the snare drum stand cradle. Two variants of hi-hat stand are also available, one with a pulley drive system for a far lighter feel. Ball-and-socket tilters for unlimited positioning, recessed memory locks and rubber cymbal felts. Up there with any thing out there at this level. Emphasis on function, but plenty of character. Counter weighted boom stands also available. Good build quality and prices add to the appeal.